With some of the narrowest margins seen in the annual Set of the Year competition, NewscastStudio has announced its judges’ picks for 2015 Sets of the Year. Winners in each category scored the highest combined points total, based on our judging criteria of overall visual aesthetics, flexibility of design, use of technology and creative use of perceived budget. Honorable mentions scored within 10% of the top finisher in each category. 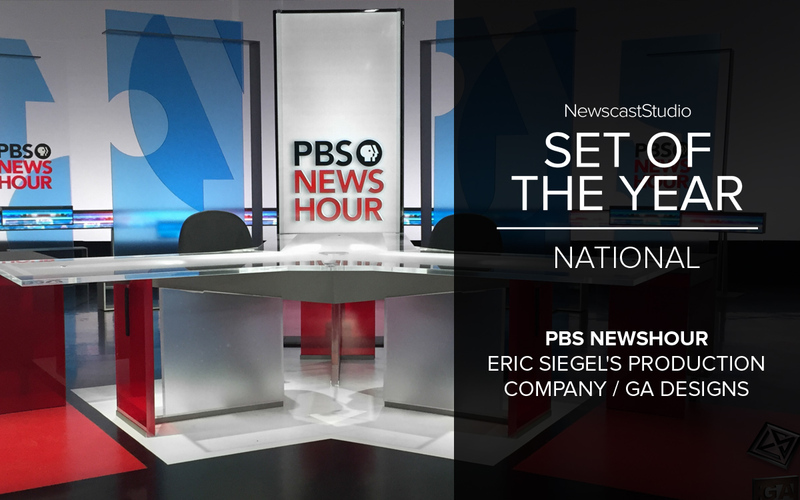 Taking top honors in the national category is the set for “PBS NewsHour,” designed by Eric Siegel’s Production Company and George Allison Design, features a unique design centered around freestanding panels that creates a clean, layered look. 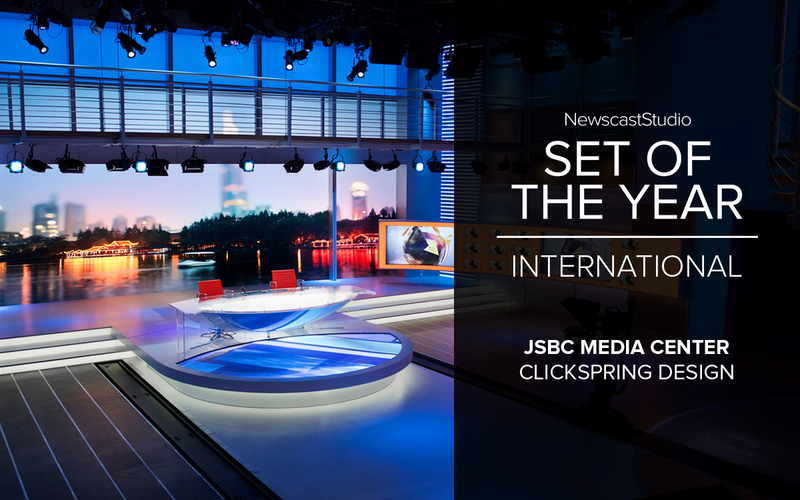 Jiangsu Broadcasting Corporation’s 6,500-square foot JSBC Media Center set in Nanjing, China, featuring a 40 by 16 foot video wall, balcony and staircase with integrated curved LED video pillar and “floating” anchor desk, was the judge’s pick for the international category. JSBC’s set was designed by Erik Ulfers’ Clickspring Design. 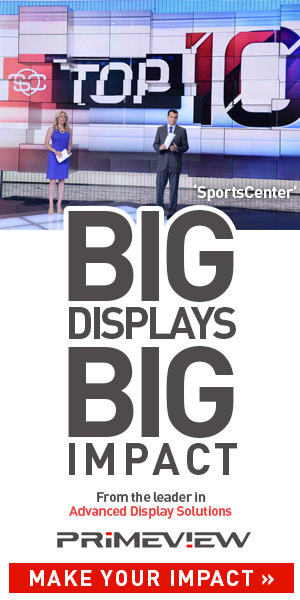 In the sports arena, MLB Network’s Studio 21, also from Clickspring Design, came out the winner. This set includes movable, suspended video panels mixed with stadium inspired archways that remind viewers of baseball’s great stadiums, while paying homage to hall of famer Roberto Clemente, who wore the number 21. 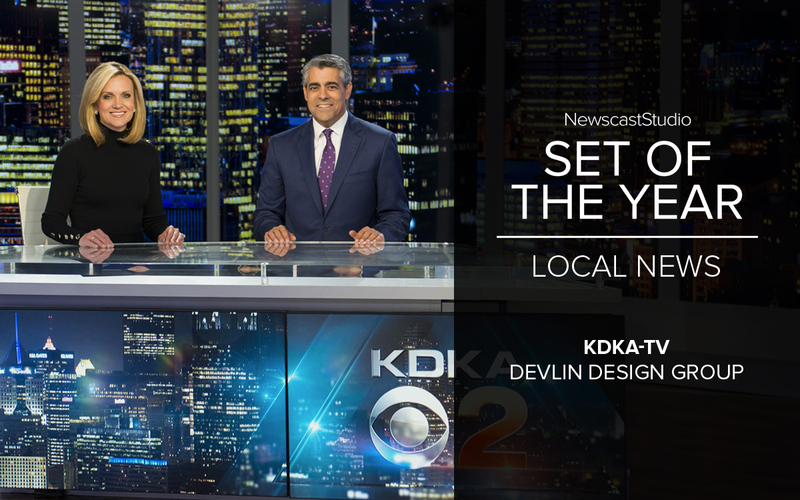 Local television stations faced tough competition this year, but Devlin Design Group’s set for Pittsburgh’s CBS owned and operated affiliate KDKA-TV ended up the winner with the panel, closely defeating projects in Orlando and Los Angeles. Judges gravitated toward the set’s open design with vertically mounted flat screens creating the illusion of a large window into the city. 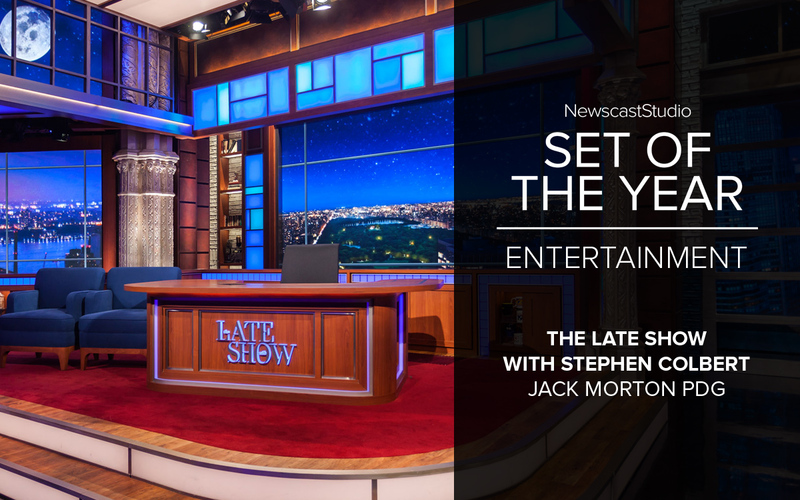 On the entertainment side, CBS’s “The Late Show with Stephen Colbert” is taking center stage as the winner of this competitive category. The bold, blocky design, created by Jim Fenhagen’s Jack Morton PDG, combined architectural aspects inspired by the show’s home while revealing new elements through a major renovation of the historic Ed Sullivan Theatre space. 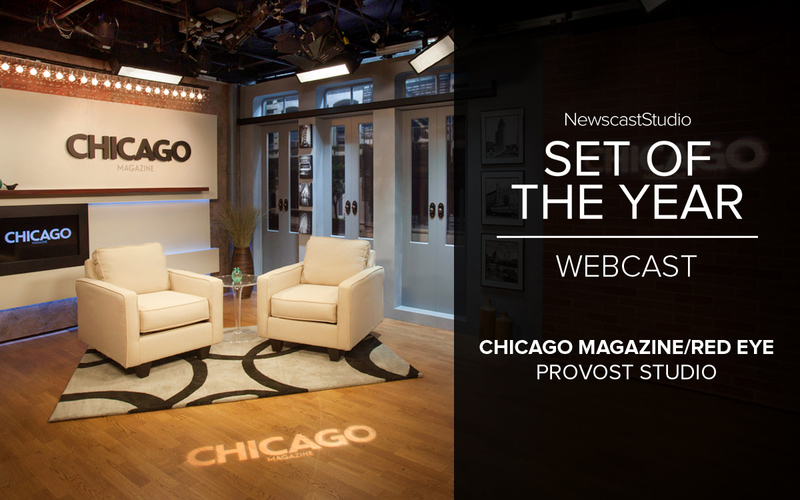 Finally, the competition’s newest category, Webcast studio design, saw the win go to Chicago Magazine and Red Eye’s studio, designed by Provost Studio. The design combined an urban feel with architectural elements for a smaller scale but high impact space that provides flexible for Tribune’s publications. Each of the winners will be honored with a custom designed metal trophy, first introduced with last year’s competition. 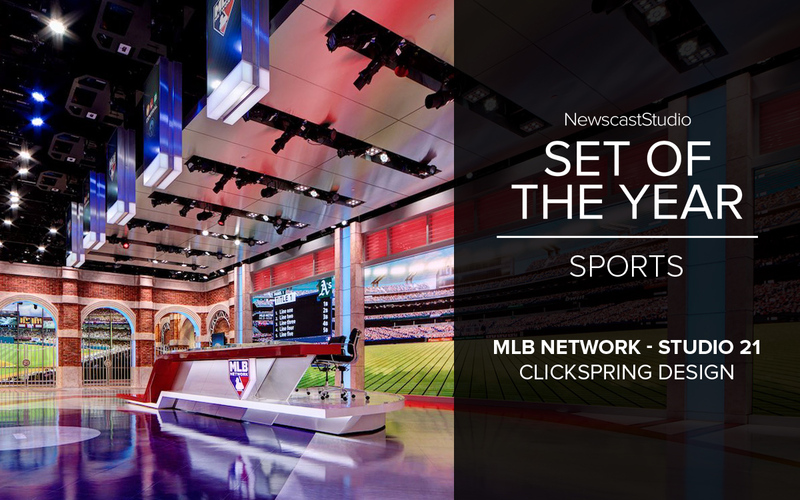 The Set of the Year competition, completing its seventh year of honoring the best in broadcast design, has quickly become one of the top and most coveted honors in the broadcast design industry and its winners often foreshadow work that goes on to win other recognized awards. 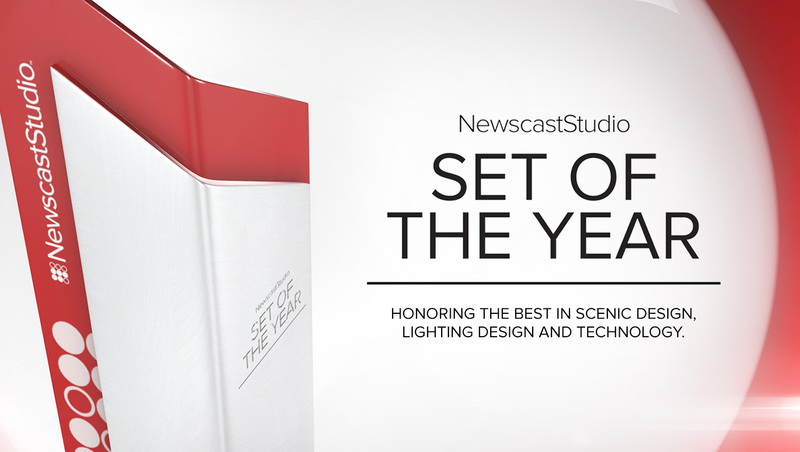 NewscastStudio is also already in the planning stages for the 2016 Set of the Year honors, which are slated to include new categories for lighting design and the rapidly evolving field of virtual and augmented reality set design.